It was a Tuesday night, the eve of my twin senior sons’ last full day of high school. To mark the day and to help me grieve it, I wanted to make it significant and momentous. I would make their lunches as I usually did, but oh, what a lunch it would be! I wanted to make a lunch worthy of the last day of high school… The Last Lunch. I gently placed each item in that brown paper bag. I wrote a note. I kissed each strawberry. I prayed over sandwiches. This lunch was the culmination of all those years I nurtured them from birth to age 18. Then I cried. Having a good, ugly cry is perfectly acceptable, dear parent, but don’t let that be your only way of preparing yourself for your child’s graduation. This milestone is worthy of some kind of dignified coping strategy. So cry and then C.R.Y. “CAST”- The Bible tells us to “Cast your burden on the Lord, and he will sustain you…” Ps. 55:22. Go to Him with all your hopes, sadness, fear and even parenting regrets. God promises to never leave or forsake us (unlike our kids!). Nothing brings us to our knees like the helpless and out-of-control feeling of letting go. Temper your expectations of how you may react and leave space for a seesaw of emotions. Despite these season changes, God remains the same. “Y”- The Y does not represent a word but rather is the form of the letter itself. A Y is a fork in the road. The stem of this letter is you and your parenting of this child. Now you’ve come to that split and you can invest more of yourself elsewhere, even as your child moves towards independence as an adult. Which direction will your life take? What else do you need to be focusing on? What areas need some nurturing and work? Your marriage? Relationships with your parents or siblings? Friendships? Your soul? 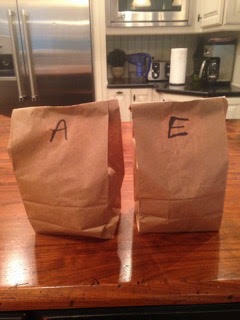 As for the Last Lunch, my heart sunk as they came home after school that day and tossed those unopened, full brown paper bags onto the kitchen table, nonchalantly declaring they didn’t eat their lunches due to the junk they ate during their class parties (but thanks anyway mom). Classic. No clue what I had put into it and survived just fine without me it.